Up north, this tight band gets feet stomping. You know at the end of the movie “Stand By Me,” when the boys are walking down the street and they go their separate ways and Richard Dreyfuss’ voice tells you how each boy ended up in life? That’s kind of like what happens at the end of each Common Crossing show (except for the whole Richard Dreyfuss thing). 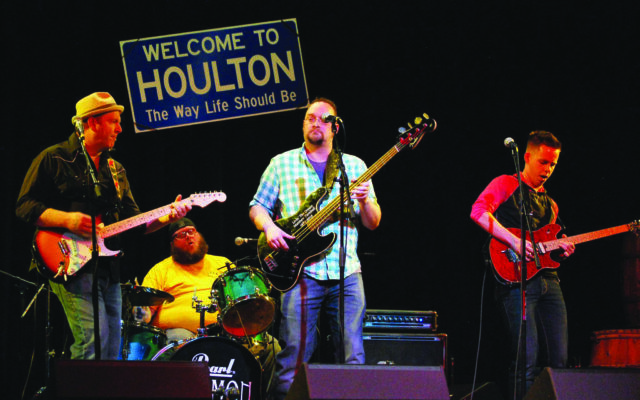 Half of the band lives in northern Maine, while the other half live south, but once a month like spawning fish they converge for a gig and suddenly, they’re all 12 years old again. At the beginning of their 20 year ride, they started out as The Blake Street Boys, a clever nod to the band’s bachelor pad on Blake Street in Presque Isle, and played the dorm circuit. “Then the Backstreet Boys came out and they didn’t play any instruments… and we didn’t want to be associated with them, so we needed a new name,” said Brian Mosher. Mosher, who doesn’t like to be thought of as the frontman (but kind of is), joined forces with school chums and core members Doug Cronkhite on drums and Shane Mountain on bass [Mosher and his family were also featured in Bangor Metro’s April 2017 issue—Ed.]. The band’s most recent and youngest addition—like, 20 years younger—is Josh Kovach on lead guitar. Together they provide what most folks in northern Maine are looking for: a good cover band. Put the magazine down and go look them up on Spotify. They actually have original tunes. Their only album (so far), produced in 2010, Seeing the Light of Day, is a throwback to 90s pop. The band has enough original material in their catalog for half a dozen albums. But like the eternal struggle for most creative folks, it takes a full moon, aligned planets and a sacrifice for them to find studio time. You know when they practice? During sound check. They’re pretty good on the fly. A year after they recorded their first album, Kovach joined the band. It was a little rough at first, having their lead guitarist (a junior in high school) greeted with odd looks when they would play at bars. At the beginning of the year they announced open slots for booking and it didn’t take long to have their year planned out. They have gigs all over Maine and it’s not uncommon for them to play a show out of state. What’s kept them going for so long could be the distance between members, their day jobs and their families. What’s that old proverb? Absence makes the heart grow fonder? “We’re really good friends. There’s a bond in the band like a brotherhood. That’s one of the strengths of the band, which is how well we get along together and how much fun we have just playing music. That’s kind of our philosophy: if we’re having fun playing music then anybody watching us is going to have fun,” Cronkhite said. With different locations, ages, and tastes in music, what would traditionally force a band to call it quits hasn’t stopped what Mosher says is a workhorse of a band. They’re like a Quarter Pounder with Cheese: a good, reliable product designed for mass appeal that’s guaranteed to fill your gut. Just don’t be afraid to order off menu and request a few original tunes. You won’t be disappointed.